Chris Krueger is a native of Fort Collins, Colorado where he owns and operates Rocky Mountain Fly Design. He is a Signature Fly Designer with Montana Fly Company, and a Pro Team member with Whiting Farms and Regal Vises. Learning the art of fly fishing early in life, much of Chris’ childhood was spent on Colorado trout waters with his grandfather, from whom he learned to fly fish. Tying his first fly at age 14, he was immediately hooked into the art and craftsmanship of tying flies and using them on the waters he fished. An artist behind the vise as well as behind his instrument, Chris tied commercially while pursuing his music degrees at Colorado State University before launching RMFD in 2014. Though most of his flies are designed for the local waters around Colorado and Wyoming, Chris' flies have found success in waters around the country for trout, bass, carp, pike, snook, stripers and musky. He has been featured in a variety of fly fishing and fly tying shows around Colorado including The Fly Fishing Show in Denver, CO, the International Sportmen's Exposition, West Denver TU Tying Expo, numerous TU chapter presentations and expositions, Bass Pro Shops Spring Fishing Classic, as well as at a number of fly shops tying demonstrations and classes and youth programs each year. Outside of fly tying and running RMFD, Chris teaches band at a middle school and high school in Loveland, Colorado and is an active professional musician on the tuba. 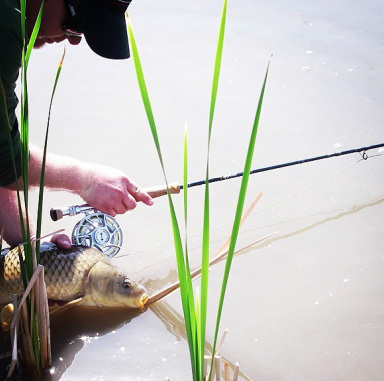 Combining his passions of education and fly fishing, Chris enjoys working with youth programs and school based fly fishing clubs, teaching middle school and high school students about the joys of fly tying and fly fishing. Chris specializes in custom designs for a variety of waters around the country and finds his niche tying articulated streamers for large predatory fish.